Recep Tayyip Erdogan’s ruling party AKP appears on course to lose its parliamentary majority after today’s general elections in Turkey, early projections suggest. According to Turkish exit polls, the pro-Kurdish HDP is set to cross the 10% threshold, securing seats for the first time. With 90% of the vote counted, the AKP had 42% of the vote, according to Turkish TV stations. If confirmed, the result would end the AKP’s 13-year single-party rule, and upset President Recep Tayyip Erdogan’s plans to boost his office’s powers. President Recep Tayyip Erdogan, who first came to power as prime minister in 2003, has been seeking a two-thirds majority to turn Turkey into a presidential republic. According to the TV projections, Recep Tayyip Erdogan’s Justice and Development Party’s share of the vote would translate into 263 seats in the 550-seat parliament, followed by the opposition Republican People’s Party (CHP), the Nationalist Movement Party (MHP). The pro-Kurdish People’s Democratic Party (HDP) would get 11.6% – 75 seats. 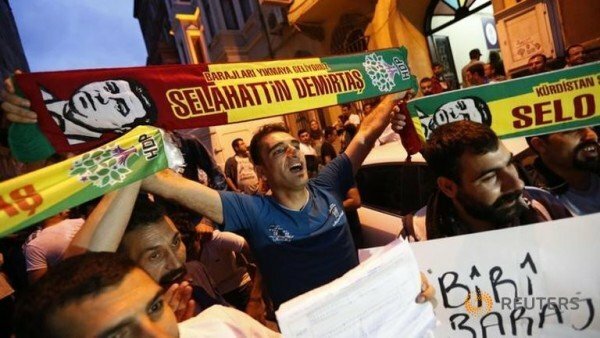 HDP co-chair Selahattin Demirtas complained as he voted that the election campaign “was not a fair and equal race”. Four people died in an explosion at a party rally on June 5. Kemal Kilicdaroglu, chairman of the CHP, echoed Selahattin Demirtas and called the campaign period “unequal”. He promised however to “continue to work with a sense of responsibility”. The result may have ramifications beyond Turkey’s borders. Turkey is a vital NATO member in a volatile Middle East and a rare mix of Islam and democracy.